The Laundry is the world's only ISO9001-approved occult intelligence agency. As a Laundry officer, you're empowered and bound to investigate bizarre cults, thwart misguided experiments, exorcise demons from computer networks or the brains of voters, and ensure that the world doesn't get destroyed ahead of schedule... and come in under budget, or the Auditors will eat your soul. 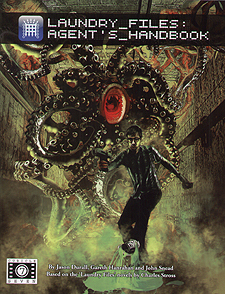 The Laundry Files: Agent's Handbook - for those employees who, on the whole, would prefer not to be devoured by alien space gods. Everyone else, from an orderly queue for Cthulhu.